At almost sea level, my lungs were finally free of high altitude. They sighed welcome relief in Lima after 18 straight days at 7,700ft or higher. I had an extra spring in my step as I deboarded at Jorge Chavez. In our trip planning, my wife and I saw Lima only as a gateway to Puerto Maldonado when we arrived in early September and, at the end, a stopover before going home, never mind the city’s function as de-pressurization chamber. It wasn’t, in other words, a destination like Machu Picchu, Cusco, the Amazon rainforest, or any other major place on the itinerary. Still, we did decide to spend a day in Peru’s capital at the end of the trip. We were met at the airport by Alberto Astete and Lourdes Valencia of One Earth Peru, the company (in concert with Crooked Trails of Seattle) that made all the fantastic travel arrangements for us throughout Peru. Despite our late afternoon arrival, we were still taken on a short tour, which included the Monastery of San Francisco and its catacombs, a drive past the Huaca Pucllana ruins and a stop at an overlook above the beaches of Miraflores that faced the Pacific Ocean, before being taken to our hotel in Miraflores. At the time I made travel arrangements months ago, I thought what better way to spend the single day than to take a food tour. 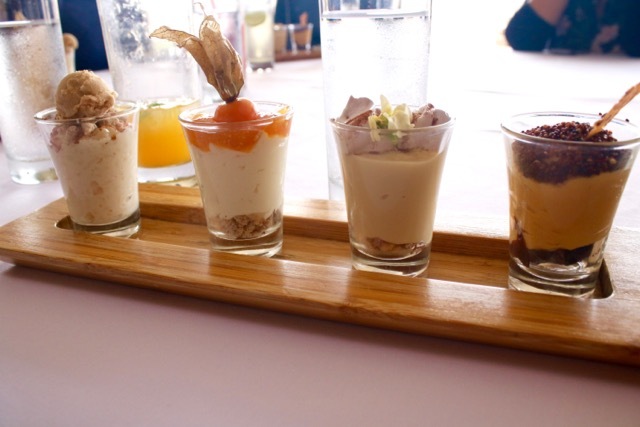 Lima is, after all, the gastronomic center of South America, the domain of superstar chef Gaston Acurio. The Lima Gourmet Company picked us up in a van at the hotel. Silvia was our engaging, informative hostess and guide. Ours was an enthusiastic group from a mix of English-speaking countries: a couple from Chicago, two ladies from Australia, one from New Zealand, another from the U.K. and ourselves (Seattle). Our first stop was a coffee shop, ironically a few doors down from a Starbucks (and would you believe Dunkin’ Donuts? ), in the district of Barranca. Tostaduria Bisetti roasts its own beans from organic Peruvian farms. It’s said that they’re fanatical about their vetting process and roasting. Each of us enjoyed a beverage of choice (mine, a delicious double-shot black espresso) in a beautiful garden area in the back, enjoyed with delicious cakes. Next was a milkshake at La Bodega Verde, this one made with a fruit called lúcuma. It’s common to Peru and very few other places. I couldn’t drink it because I didn’t have a Lactaid tablet. Too bad, because my wife said it tasted like butterscotch. San Isidro Mercado Municipal has one of the nicest produce stands I’ve seen anywhere. The quality and variety at Ortiz Fruteria was mind-boggling. 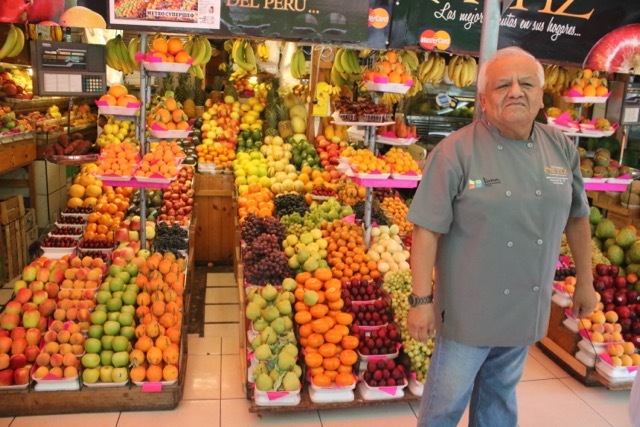 The produce there is good enough for Gaston Acurio. There was quite a selection of Amazonian fruit, including mangos, bananas, granadillas, starfruit (carambola), lúcumas, pineapples, guavas, papayas, oranges, grapefruit, limes (which are interestingly called limón), chiles, cacao, coconas, avocados (palta). Many of these I saw on a farm near the Tambopata Nature Reserve at the beginning of the trip. We were given samples of fruit I’d never tasted before and some I had, but varieties I’d never get at home. I read somewhere that the abundance of fruits in Peru would be astonishing, and it truly was. Our next stop was Embarcadero 41 Fusión, a restaurant in Miraflores. 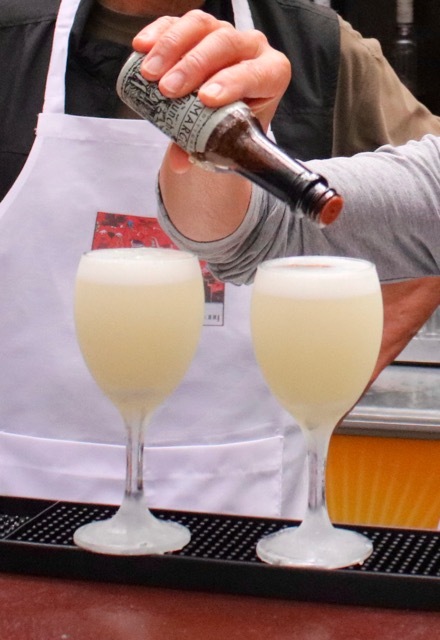 I had my share of pisco sours throughout Peru—they might’ve replaced margaritas as my favorite cocktail—but here was the opportunity to make one with the restaurant’s mixologist. I’ve posted before the recipe she gave us, so I’ll only add that our entire group, two at a time, had the chance to make them in front of everyone else. The pisco brand they used was either Cuatro Gallos or Portón, a three-grape blend of the latter readily available here in the States. This was definitely a fun experience. All we had to do was slide over from the bar to the dining area to learn next how to make ceviché. I have to state that my preferred way to eat raw fish is as straightforward sashimi with only soy sauce and a bit of wasabi for flavoring. Anything else is excess, which is why the idea of ceviché never struck a chord with me. I had poké on the U. S. mainland, which never impressed me much, until I had it in Hawaii, which was an eye-opener. Here was faultlessly fresh and buttery fish (ahi) dressed with other ingredients that in the right proportions could make me swoon. 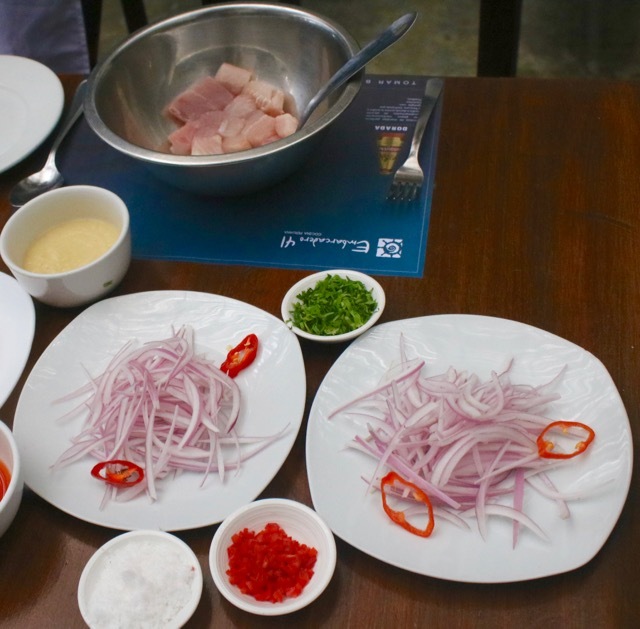 Now I was going to be in Peru and ceviché, especially in Lima, was on everyone’s list of must-haves. The first time I had it on the trip was in Cusco where the fish was trout, so readily available in mountainous Peru. It was certainly good, though very tart from the liberal use of Peruvian lime (limón), which has the characteristic of being extremely sour. The Embarcadero chef showed us in what proportions to use limón juice, fish broth, red onions, chiles, cilantro and sea salt. We could, if we wished, alter the amounts according to preference. I stuck with the basic ratios, with a bit more chiles for added spiciness. The fish was sea bass. Before I continue, a word about Limeños and fish. Silvia remarked that by afternoon, the people of Lima consider any fish caught that morning to be too old. Limeños tend not to eat ceviché for dinner. The sea bass in front of me was very fresh, I gathered. The ceviché was exceptional, nicely balanced, tart without being puckery, onions providing a nice bite, seasoned with just the right amount of salt (pictured at top). Peruvians like to accompany ceviché with cancha and, of course, the ubiquitous potato, which I can do without. 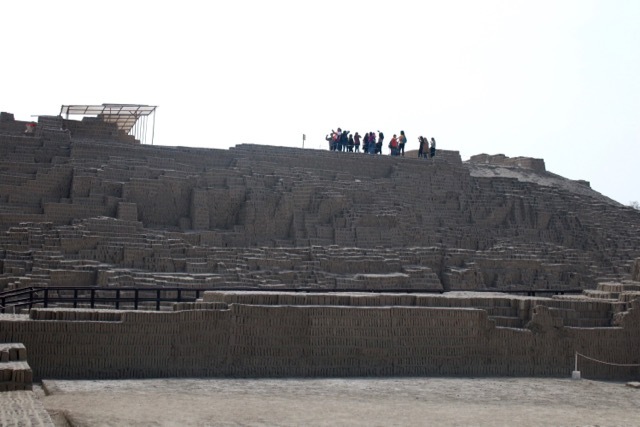 As if the group hadn’t had enough to eat, we were next taken to Huaca Pucllana Restaurant that was next to the famous pyramidal ruins that look like terraces of upright bricks, thought to have been built by the ancient Lima Culture. The restaurant is definitely upscale, someplace one would go for special occasions. Its location next to the ruins provides lots of ambience, especially at night when they’re lit up. I had no idea we were coming here, but as the visit was included in the tour, all my wife and I did was to sit back and enjoy. What followed was a bunch of shareable small plates, all wonderfully prepared, featuring Peruvian ingredients. There was no menu to look at. The food arrived, we ate. Silvia rattled off their names, but I couldn’t keep track. Several desserts came at the end. The meal was a spectacular end to a culinary adventure. My wife and I were taken back to our hotel. Because we had checked out of our room before the tour, we walked over to the beach area and wandered around Larcomar, an outdoor, multi-level shopping complex, before we went back to the hotel’s spacious lounge area to spend the last few hours in Lima (and Peru). We would finally be going home late that very night. The food tour, which was sort of an afterthought, turned out to be a wonderful and fun conclusion to an almost month-long trip to South America that will remain one of our fondest travel memories. Take a boat tour to the Uros Islands out of Puno, and the package will likely include a visit to Isla Taquile (Taquile Island). Where? you ask. That’s what I said when I booked it. OK, I thought, as long as I get to see the reed islands. Turns out, if I had done my research, I should also have looked forward as much to this visit because of a marvelous cultural tradition that earned it the rare UNESCO designation of Masterpieces of the Oral and Intangible Heritages of Humanity. Rolls off the tongue, doesn’t it? That’s quite a mouthful, a designation that I have trouble repeating without stumbling over the words. To be serious, the idea behind it is to recognize an ‘intangible’ art that needs protection and faces pressure of disappearing without it. It involves a cultural heritage or tradition in which an entire community gets involved and goes further by recognizing the observance as a form of cultural identity. It could also include spaces where these activities take place. Examples are expressions of art, craft, music or dance; festivals; markets; rituals; language or other forms of oral heritage. To date, there are 166 such proclamations. 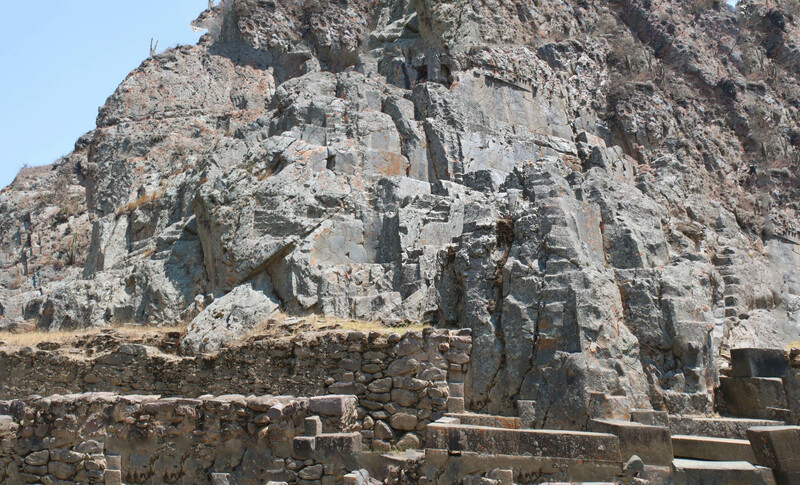 The approach to Taquile from the west was visually impressive because of extensive terracing, the legacy of the Incas who took the island by force in the 15th century. On de-boarding, my tour group was instructed to meet in the central plaza. It wasn’t effortless getting there, the middle of the island. The western side of Taquile challenges anyone who hasn’t gotten accustomed to the thin air. The stairs were a steep climb, though my lungs kept screaming Everest. No tour information I saw warns visitors who might have respiratory or cardiac issues. A local woman offered muña leaves to ease the strain. When I finally got to the plaza, I discovered that the world-famous woven products are displayed and sold in a community building facing the plaza. Taquile Island, with a population of only 2,000, was bestowed the UNESCO recognition for the exceptional quality of its hand-woven clothing and textiles. If the skill involved in making them were all that was considered, that would’ve been the end of UNESCO’s vote. Here, there’s more to it than that. All able-bodied Taquileños take part in the handicrafts. The women do the weaving, and the dyeing and spinning of wool. The men, including boys as young as 8 years, do the knitting. Women and men both wear the chumpi, a wide colorful belt woven by the women with ancient patterns depicting annual events. Islanders have worn these belts even before the Spanish arrived. The men knit chullos, the ear-flapped hats that are seen throughout the Andes. The ones the men here wear are distinctive for their extra long pointed tops that drape over the wearers’ heads down to their shoulders. The ones for sale have different designs than those worn by the island’s men. It isn’t just these two famous garments that make what the Taquileños do so distinctive but that they make their entire wardrobe, a mix of Spanish peasant and traditional Andean clothing, and utilitarian textiles, the crafting of specific articles relegated along gender lines. And they wear them in their daily dress. Weaving requires skills that are passed down from one generation to the next and is an integral part of the island’s culture and social practices. Certain garments, like the chullo, coca-leaf purse or almilla (the woman’s shirt), even reveal the wearer’s marital status. It is for these reasons that UNESCO thought it important to recognize the weaving arts of Taquile and help preserve its way of life. The pace seems unhurried on the island. There are no cars or roads, no running water. And with no electricity, there are no cell phones or other powered devices or appliances. After our group gathered in the square, we were taken to an outdoor dining area where we were served a prix fixe lunch. Lunch was followed by a harvest dance performed by men, women and children. The walk back to the boat took a different route, one on the other side of the island. It was noticeably longer than the arrival, more gently sloping but downhill. With no need to catch my breath, it gave me the opportunity to appreciate this beautiful place, set in the sea-like Titicaca, above it a deep blue sky that you find only at high altitudes. The peace and solitude are intangible, like the weaving culture. Two hours after boarding the boat, I was back in Puno, thankful that I had the chance to experience an island that hadn’t entered my mind at all before taking the tour. Wonderful surprises like that thankfully happen every now and then. Islas Uros, What Price Commercialism? It’s like walking on a waterbed. Unnerving at first, there is a definite squishy firmness under your feet as you walk on an island made entirely of totora reeds, so thick that there is no danger of falling through into Lake Titicaca. Even so, the feeling that water is underfoot never leaves you. Lake Titicaca is an incredibly large lake at over 3,200 square miles (8,300 km2). 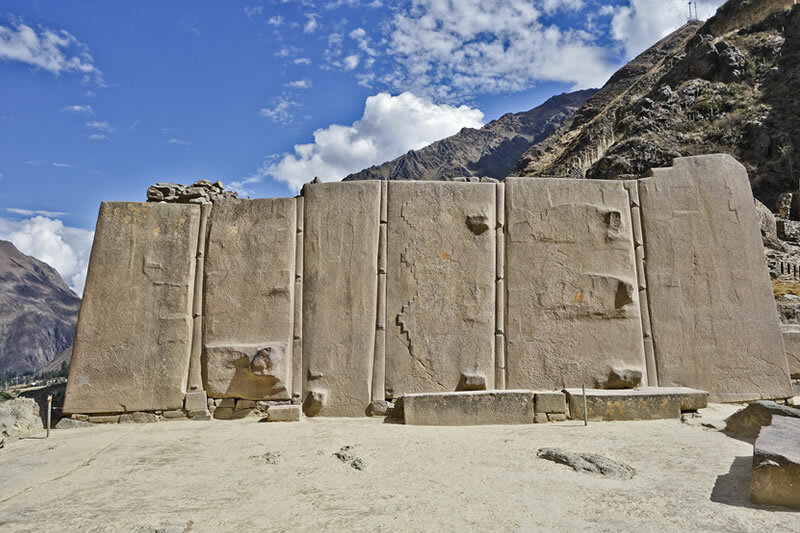 It is the mythical birthplace of the Incas, the progeny of Manco Capac and Mama Occllo, and straddles both Peru and Bolivia. Lake Titicaca (image from wikipedia). The Uros people have been living on these floating islands for centuries. It’s thought that the idea arose because the Uros wanted to escape marauding enemies like the Incas, which explains why there are still watchtowers on many of the ninety or so islands. This strategy couldn’t have been successful because the Uros were subjugated anyway. Really, how can you escape a determined army by isolating yourself on a tiny island? But their culture and way of life endured. Historical necessity aside, these islands are really remarkable. Everything is made of totora reeds, including the homes that sit on them, as many as ten on an island, and the double hull boats that have an uncanny DNA to those of ancient Egypt and Easter Island. The reeds grow abundantly in the lake. Because most of the buoyant reeds are underwater, they rot quickly, so there is the almost perpetual need to overlay existing layers with a new one, as often as every two weeks. Rotting reed foundation needs to be topped with a new layer often. I made arrangements to visit the islands through my hotel, a tour that also included a stop at Taquile Island, but you can walk right up to the boat launch area in Puno and purchase tickets. You can also arrange for an overnight homestay. The Uros have been receiving tourists for a while now. It has gotten to the point where it seems there is inordinate reliance on visitors to supplement their income. Another way to put it is that tourism has changed their traditional way of life, for better or worse. Tourists come in droves, transported by commercially-owned motor boats or community-owned ferries to one of the participating islands. There was the opportunity to take a ride on one of the marvelous boats, in our case, a catamaran flanked by two traditional double-hulled boats. But the privilege cost each of us S/10, which wasn’t voluntary. Before the tour moved on to Taquile Island, the passenger boat made one more stop for tourists to get an official Uros Islands passport stamp. I was surprised (or maybe not) that it cost S/1. Granted the amounts I’m talking about didn’t break the bank. At the going exchange rate of $1 = S/3.4, we’re talking peanuts here. Should I have just sucked it up? Maybe so. It’s just the idea of having to shell out for every little thing through pressure, guilt or obligation. Maracuya, Granadilla. I’ll Call It Passionfruit. I have had my share of passionfruit the last several years. I consider it my absolute favorite exotic fruit whose incredibly heady aroma can fill a room with its unmistakable scent of the tropics. My frenzy started out in New Zealand where the fruit has a dark, purplish rind and crunchy seeds not unlike pomegranate. One time, my daughter bought a whole bag of them. It disappeared in no time. The same variety was available in Australia, where it was served as a fruit for breakfast at a resort I was staying at in Torquay. My wife and I ate several each morning. One of the servers noticed and was kind enough to see us off to Melbourne with several more to take with us. I’ve also had passionfruit in Hawaii, where it’s called liliko’i. The most common form is oblong, has a yellow rind and tart and sweet fleshy seeds. The islands grow other varities, too, which I’ve sampled. But I hadn’t expected it in Peru, at least not in the quantity that was available there. The first I saw it was at an ecolodge in the Amazon basin where the fruit also was served for breakfast but in a basket with other fruits. It was yellowish to orangish, globular and about the size of a medium apple. My wife asked a server what it was. Maracuya. Passionfruit. We split it open from its styrofoam-soft rind and beheld a huge bunch of seeds (see top image). The flavor was more mild than New Zealand fruit and doesn’t have its intense aroma, but the seeds were less crunchy and, as I said, there was a humongous amount of them. If you’ve never had raw passionfruit seeds, think of a mass of slimy, slippery polliwog eggs with a taste of the tropics such as you’ve never experienced. You guessed it, we had maracuya for breakfast everyday we were at the ecolodge and whenever it was available at all our subsequent hotels throughout Peru. Talk about obsession. We also were told that it’s really called granadilla although I’ve never been able to find anything on the internet that distinguished it from maracuya. I’ll just call it passionfruit. Passionfruit is famously exploited in desserts and drinks. The Kiwis and Aussies have their pavlova, the Hawaiians their plethora of liliko’i desserts (including shave ice), the Peruvians their maracuya sours. I like it just as well straight from the rind, juices dripping from my fingers, seeds crunching between my teeth and perfume overwhelming my olfactories.